Purpose: Olson Engineering Inc. has performed several Nondestructive Testing (NDT) investigations on historical structures, including the Lincoln and Jefferson Memorials. 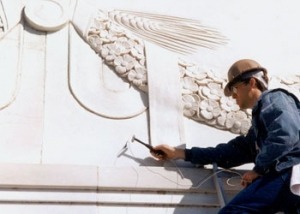 Lincoln Memorial: One of the objectives was to establish the effectiveness of stress-wave NDT techniques for determining the condition and characteristics the marble elements in the Lincoln Memorial. The investigation was conducted as part of the Lincoln Memorial Stone Survey for the National Park Service (NPS). Jefferson Memorial: Olson was contracted by the NPS to perform NDT testing to locate metal support structures behind the inside facing marble on the Jefferson Memorial. The evaluation was done to update and verify partial information available in drawings, and to provide a current indication of the steel condition. 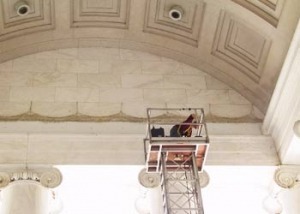 Additionally, Olson conducted NDT investigations to evaluate vibration levels of various elements of the Jefferson Memorial in the presence of simulated construction activities. The investigation was conducted as part of an overall evaluation and rehabilitation effort being conducted on the Memorial. Lincoln Memorial: The investigation used the Impact Echo (IE), Ultrasonic Pulse Velocity (UPV), Sonic Pulse Velocity (SPV) and Spectral Analysis of Surface Waves (SASW) methods to investigate stone conditions. 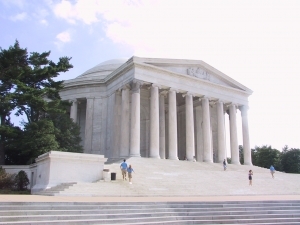 Jefferson Memorial: The structural support evaluation was done using Ground Penetrating Radar (GPR) while the vibration survey was accomplished with Vibration Measurement (VM) and Impulse Response (IR) methods. 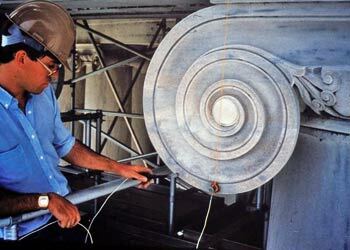 Lincoln Memorial: Nondestructive testing was performed on 35 stones of various types on the Lincoln Memorial. These included 130 points in 23 areas using the IE method, over 100 points in 25 areas using the UPV/SPV methods, and 12 areas using the SASW method. The investigation included tests of selected Stylobate, Cheneau, Penthouse, Column and Ceiling Coffer stones located on memorial. Jefferson Memorial: The structural support evaluation focused on the inside facing marble of the North Wall of the Portico of the Jefferson Memorial. GPR scans covered the entire face of the tested wall as well as areas of the wall above the lower ceiling of the portico. The vibration study was performed to measure the levels produced by various pieces of construction machinery in use around the Memorial. Vibrations of architectural elements of the Memorial were monitored during simulated operations of construction equipment. Lincoln Memorial: The results of the NDT investigation led to conclusions as to the applicability of the various stone testing methods. The most effective way to evaluate the condition of all stone types on the Memorial was to use one or more of the 4 methods in conjunction with a visual survey. The IE method was the most useful for determining the presence or absence of damage when only one face was available, and was also useful in determining the location and depth of some cracking damage. The UPV/SPV methods were more applicable to testing massive elements where access is available on both sides (such as columns). These methods were also effective in determining the depth of surface cracks. The SASW method is less applicable to crack and flaw location but is useful in determining the relative material properties of the stones as well as the depth of surface weathering effects. Jefferson Memorial: The results of the GPR tests showed the existence, approximate size, and locations of the steel members. Examination of the available drawings confirmed that the GPR results agreed well with the drawings in terms of locations and approximate sizes. The results of the vibration study were used to make recommendations as to which equipment would not be harmful to the Memorial during use in a given area for construction activities. The maximum vibration amplitude measured from construction equipment was 0.037 inches per second (ips) in peak particle velocity units. This maximum vibration was measured with a vibrating plate soil compactor located only a few feet away from the step. This level of vibration corresponds to a strain on the order of 0.0000002 in/in, which is a very low value for the materials in question. The results of this investigation indicated that none of the simulated construction activities and equipment used produced vibration levels which were considered to be potentially damaging. The results of the vibration studies were used to make recommendations as to the allowable equipment and locations of usage for work on and around the Memorial. Olson recommended monitoring of sensitive elements during construction activities near the Memorial to ensure the limits were not exceeded.